Lately I've been in the DIY mood. Maybe it's the heat that makes me want to stay indoors and get all crafty. Either way I'm loving this kick that I'm in. After seeing a bunch of bloggers (aka Going West, Sorelle in Style) doing the DIY neon chain necklace I decided to give it a whirl myself since I have been lusting over some pretty expensive ones. This is another simple little DIY project. 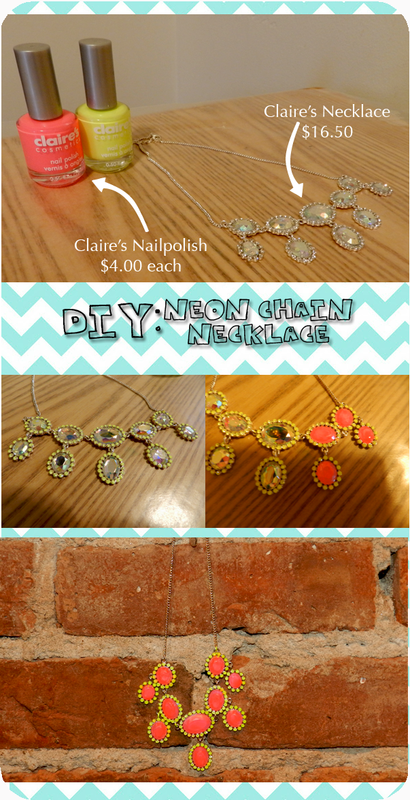 All you need is a cheap crystal necklace and some neon nail polish! Start with one coat of nail polish paint on the crystals going all the way around the necklace. Add extra coats a paint to really make the color pop. Wait for it to dry! BAM your own Neon Necklace. What I love about this necklace is that it adds a nice pop of color to a simple look. It really makes a statement all on its own without being over bearing. What do you think about this DIY? Would you give it a try? That is so beautiful!!! How come I have never thought of that!?!? Thanks for sharing! Love this. The final product is great. This is the COOLEST thing ever! I have a sufficient neon necklace but I love that you can make your own colors with this! Ahhh, awesome. Wow, this is so creative! I love it. awww....adorable!! loved that you used nail polish!! That's brilliant! I can't wait to do that, thanks for the idea! Also, thank you for your lovely comment on my blog! Amazing DIY! !, I follow you now :), kisses! Amazing idea! I'll try this!!! Lovely necklaces. Really tempting to buy. I'm a lover of costume jewelry and a plated chain is what I always wear at my outings. Maybe I should get a few of your designs too. this is AMAZING DIY>>love the result!! I really love big necklaces! I did a DIY similar to this, I'm now neon nail polishing everything! This is such a great idea; definitely gonna do this. oooohhhh! it looks really awesome! i need to do this! This is such a great idea! I will definitely try this ;) Love your blog! Please check out mine- I would really appreciate advice! Love this DIY! That Dannijo necklace is too awesome. this is an amazingly cool idea! This is so cool! What a simple, yet great idea!! Your finished product looks amazing!